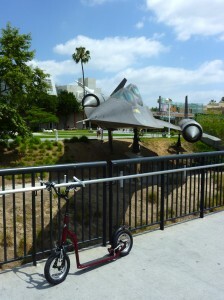 Los Angeles is a better place to be than many cities when it comes to finding a nice place to scoot. But sooner or later the 26 mile beach bike path becomes so familiar that the urge to explore further kicks in. Google Maps has a bicycle overlay with puts bright green lines on the map showing places that are either dedicated bike paths, or bike lanes sharing the street with traffic. 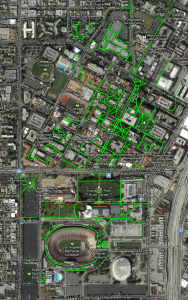 Applying this overlay to Los Angeles brings out two prominent green patches of fun. These are the university campuses of UCLA in Westwood and USC in South L.A. I have been into these enclaves many times over the years, especially UCLA where non-student Angelinos go to get medical treatment and dump their hazardous waste while taking in a concert or ballet. I have been to UCLA enough times to realize that it is on the side of a giant steep hill. 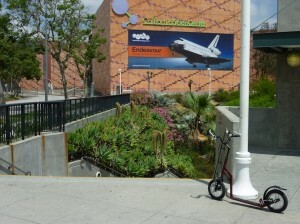 And so USC which is on a broad alluvial plain between the L.A. River and Ballona Creek is the flatter choice. 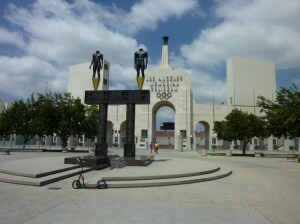 For me, UCLA is closer but it is hard to park near there, and less than two miles from home is the Metro Expo line, so I planned to take my scooter onto the train, and head downtown to scoot USC. If I were more of an athlete I could watch the train from outside, because a nice, quiet, new, mostly-deserted, bike route shadows it all the way from Culver City to USC, about ten miles, but I wanted to save my energy for the campus itself. 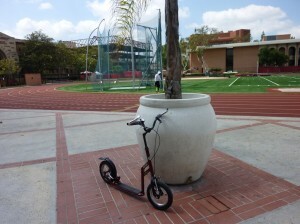 USC’s bike paths are represented on the map as public bike paths, but technically this is private property. Bicycle users are required to register their bikes with campus police, mostly to combat theft, but I have read that many students use longboards on campus and so since a scooter has more in common with a board than a bicycle machine, I decide I should be okay and hope to slip under the radar as a nutty old professor of dynamic physics on a scooter. After riding a mostly empty Saturday morning train from Culver City Station to Jefferson/USC station, I found that the campus was also mostly empty. This was the day after commencement so workers were loading many thousands of chairs and tables onto trucks and disassembling stages, gantries and banquet tents. A few students had their caps and gowns back on and were posing for family photos beside statues, fountains and building signs. The bookstore seemed very busy, but it was the weekend between semesters. The riding surfaces were extremely wide and consisted mainly of smooth concrete with a few brick paved sections. The brick paving was also remarkably smooth under the 12.5″ inflatable tires of my Mibo Gepard scooter but I am sure they would give more of a bone rattle to those on smaller polyurethane wheeled scooters. 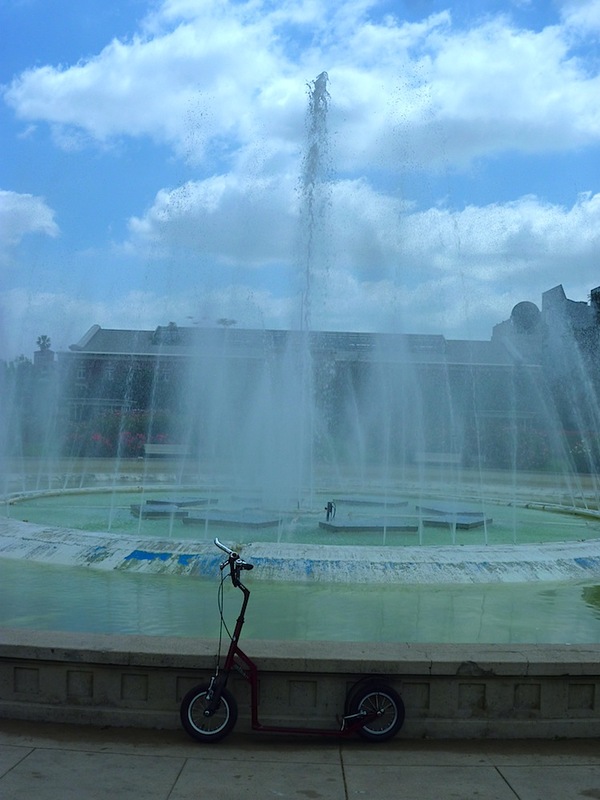 Despite there being quite a few large trees between all the statues and fountains, I noticed no pavement lifting with the associated tricky cracks that often defeat the scooterer. 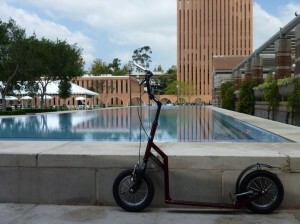 It was a remarkably smooth and fast level ride all over the campus, so much so that I kept surprising myself by reaching the perimeter after what seemed to be a short run in any direction. Some parts of the pathways were marked as bike lanes but I felt okay flying around anywhere. At Cromwell Field, the red-rubber oval running track, I was so tempted to do some laps on the scooter, but out of respect for any rules that may have prohibited it, I refrained from doing so. North of Jefferson, University Village is marked on the map as bike lane, but here I began to realize that someone has been over-generous with the green lines on this map overlay. University Village is really just a small mall, and the surface is pebble cobbles, not a problem on the Mibo, but probably unridable on a Xootr or Razor. South of Exposition, which is really more Exposition Park than USC, I enjoyed scooting a lap of the Coliseum, home to two Olympic Games, but this lap was further out on the roadway because the green oval shown on the map is inside the fence. There were more people down here on the Exposition Park side because there are busy museums here and people flock to see the space shuttle, dinosaur fossils, butterflies and more. I concluded my ride with a cooling mist from the large fountain in the Jared Park Rose Garden and then scooted back to the train. I will guess there are about ten or twelve miles of bike path in the USC area, and most are flat, smooth, fairly empty, shaded, and interesting. I found this ride to be very enjoyable. While most people hardly gave a second look to lunatic speeding around on a scooter, there were also a few who stopped to turn and stare as if I were riding a space chicken and dressed as a potato. So a normal range of reactions there. So all in all, highly recommended for scooting, and a nice change from the beach. Jeffrey the Barak did not go to school at USC, but he did once learn how to eat bananas and play the xylophone underwater. NextNext post: Are we building the wrong way?